104hp 7u live system - how's my research coming along? Here is another first time Eurorack build. How am I doing? My goal: create an instrument/live performance system. Like many others, I have DAW fatigue. I love Ableton, but I strongly desire to get away from the pixels and mouse and into something both tactile and force myself into the live playing limits of a physical thing. Background: I am an Ableton user and big Max device user. I always end up with many many M4L LFOs and Envelopes and find myself throwing together Max BEAP modules (especially the FM ones) together rather than using Ableton's prepackaged synths/instruments. I have also built some synths from scratch in Max following the Baz and Delicious tutorials. So I have a pretty good understanding of the signal flow and gates and VCAs that lines up with the tutorials I have been watching on modular. Basic groove box: drums and two synth voices. I think I minimally need delay (Disting) and reverb (Springray) and distortion (via Pedal I/O) for effects. I want to be able to mix within the case. 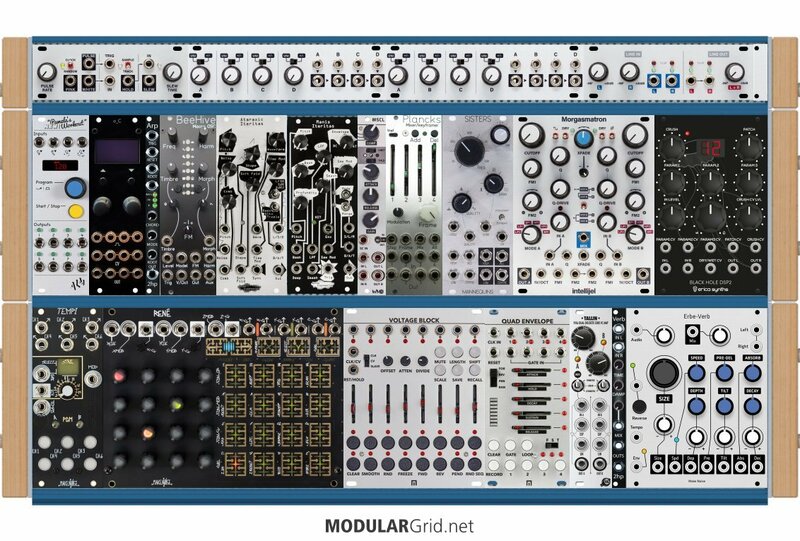 Self-assessment: I'm gravitating towards the the really big modules and maybe that is coming at the expense of having enough utilities and modulation sources. Notably absent is a dedicated filter (!??! ), but the Atlantis has its own. Disting has one, but I am not clear on how much I can make the Disting do multiple things at the same time. Because it demonstrates my thought process, here are the things I have taken out of previous iterations, mostly but not entirely, in an effort to fight the Big Module Syndrome I suffer from: Erbe Verbe, Z-DSP, Plonk, basic Doepfer filters, Marbles, Hexmix. 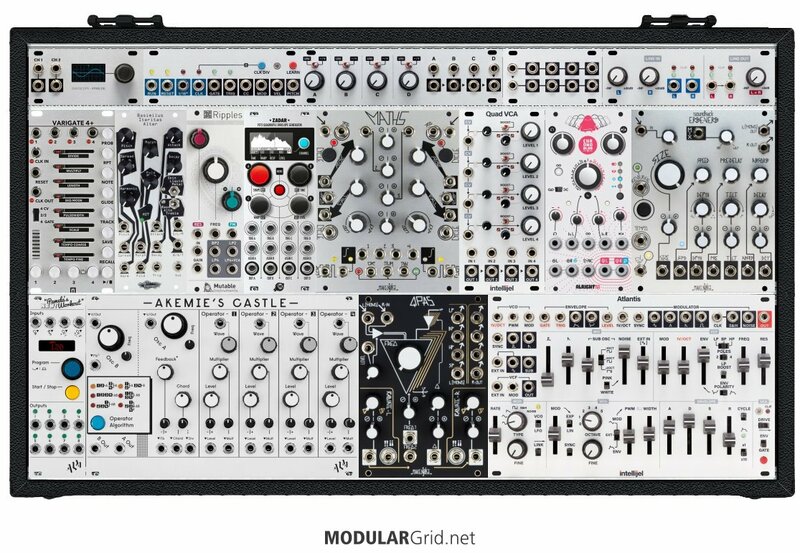 I will be starting with the Intellijel case, 1 row modules and Atlantis and using an external MIDI sequencer to get familiar with the Atlantis while I research, plan and save for more modules. All comments welcome, including things like an order to purchase things cuz that won't happen all at once. Are Stages and Maths enough modulation? Is the Quad VCA enough VCAs? Can I get away with no filter for the Basimilus and Akemie's Castle? Are there alternatives to the Metropolis to consider (Varigate 8, maybe)? What don't I know yet that is evident in this setup? Stages and Maths would be OK normally, but the Akemie's is going to eat envelopes for breakfast. Remember: Chowning FM is very envelope-intensive...that's how you get your timbral shifts within the duration of an event, by applying multistage envelopes to a lot of the oodles of parameters. If I were you, I'd be looking at a couple of modules that have a lot of envelope generator density, such as Qu-bit's Contour, Doepfer's A-143-2, or a combo of Erogenous Tones' RADAR and Ping. That'd really make the FM pop and jump. Plus, yes, do consider a basic VCF for the Akemie's...the combo of FM + good analog filtering is something you'll really get fond of. Also, I'd lose the Roland mixer. For one thing, it has its own 1/4" out pair, and your Intellijel cab has that already (plus you also have the Intelljel I/O in the build) and having another pair of outs seems redundant. My take there would be to go smaller, but still stay in stereo. Have a peek at Verbos' Scan & Pan...stereo, four in, VCA level control plus CVable panning, plus some neat capabilities for crossfade/channel scanning that are a bit unusual, all in 14 hp. That also solves your VCA question, given that that mixer can do your exponential audio VCA duties, leaving the Quad VCA free for CVs or other spot applications where a single free VCA is needed. Hmm...that Basimilus...do you need it? You could jam a couple of Moffenzeef Dial-ups in that space and still have 2 hp left...or, you could reclaim a bit more space and add those plus a Muskrat for three channels of glitch/noise percussives. Or the Dial-ups and maybe a couple of Erica Pico Drums to combine conventional sampled drums with glitched-out ones. So, instead of going with the question of adding a filter for a single percussion source, see if you think that a few of them minus a filter might be more capable. That would require more gate/trig channels than the Metropolis would have, but since you're contemplating the Varigate 8+ already and that one would be more than ample, I'd say go with that instead. Last, swap the buffered mult for Intellijel's passive one. You're not splitting CVs enough in here to worry about voltage 'sag', so regenerating CVs won't be necessary, and you can save a few bucks that way. The Roland 531 offers six channels of mixing plus pans and pan automation (CV) on every channel. You may or may not want to ditch it depending on your anticipated needs. The Disting mk4 can only be dialed into one set-up at a time. So you can't use it as a filter and a distortion effect at once. You have a little space left in the rack as-is. I think there's enough room for a 2HP filter. If you're coming from Ableton you may want to consider a 1010 Music Toolbox as your sequencer rather than the Metropolis. It takes up less space and the workflow is similar to a DAW rather than a classic modular sequencer. That will give you more space for other modules. The springray is just an interface for a spring reverb tank. So you'll have to haul it around with your rack. If that's not a problem, cool. If it is, you can probably replace the SpringRay with something DSP based that is smaller. The cost between a passive 1U mult and an active one isn't enough to go with the passive. I'd go active and not worry about it. (respectfully disagreeing with Lugia). That Atlantis module is the real pig in HP real estate, I'd sacrifice first (personal opinion). It's a self-contained synth voice (oscillator, filter, VCA, etc.). So you may be better off using the space for a dedicated filter, another dedicated oscillator, and perhaps some other modulation/envelopes. Xaoc is coming out with a new envelope generator (digita), with four envelopes. I'd check that out as well and see if it fits into what you're after. I just started a second 104HP 7U case and most of the space is already accounted for. So you'll really want to consider the size of the modules you've selected, their value, and any need to expand. No matter what you do... you'll feel like you're "wrong" about your choices and then rethink your plans about 4-5 times. Best bet is to build in stages rather than all-in so you can rethink your plans once you've got some knob wiggling time under your belt. It is noticeable that you refer to the Akemie's FM as "Chowning FM". Isn't all FM synthesis based on Chowning's work? Is there another kind of FM used in modular? Or are you are just highlighting the fact that the Akemie's is not a simple two oscillator FM with one carrier and one modulator? Just trying to make sure I am not missing anything. Thanks for the recommendation about the multi-envelope modules. They look very interesting, but I worry that especially with the RADAR and A-143-2 that I don't have enough modulation sources to feed into them. This definitely highlights that a 104/7u case gets filled up incredibly quickly. Seems like the Malekko Quad Envelope or Intellijel Quadra could be space saving alternatives to the RADAR or A-143-2. Thanks for the tip on the filtering. This raises more afraid-to-ask filter questions: I read/hear a lot about how great Wasp filters are. First, is the Doepfer one THE wasp filter, or is it a general category? Is a Wasp filter a good choice as one's only filter? The Scan & Pan seems like a great option. One question about those comments: is there something specific about the Verbos mixer that is different from the Roland mixer in how it frees up the VCAs? i.e., would the Roland or any other mixer also free up VCAs? For the Basimilus vs. Dial-ups, here is my thinking. The demos on the Moffenzeef website maybe don't sell it very well, but the Dial-Up does not seem to have the same range of sounds to my ears. It is not so much a glitch/noise drum that I am after. I am also drawn to the multiple waveforms and the harmonic sculpting and the potentially long decays that make it blur the lines between drum/percussion and bass/synth lines. One way I imagine using it would involve trying to morph a beat into a bass line in a song transition simply by turning the dials and that could free up some time to adjust settings on other voices while they have been taken out of the mix temporarily. But another question to your point about the Metropolis not having enough gate/trig channels: could the clock divider be used to generate another gate/trig signal? The thing about the Metropolis that is so attractive to me is that it just makes sense. It is very clear how the core parts of the sequencer work. As someone new, I really worry about overloaded knobs and sliders where the state of the whole sequencer can be different from the current state knobs and sliders. And the Varigate 8+ seems like it could have that confusion for me. Ronin, thanks for the comments. The 531 mixer does seem to also be slightly future proofed with the six channels. People usually talk about expansion in terms of buying a larger case than one considers at first, but maybe this would apply to a mixer, too? Thanks for the clarification on the Disting and the point about the Springray. The latter was completely not obvious and I would have missed that. Reverb modules feel pretty hard because they are fundamentally pretty simple (we all know what reverb sounds like), but as a newcomer without experience it seems hard to know which criteria to use to evaluate and make a choice. The 1010 is a good suggestion, but with the 1u MIDI, I will also just be able to wire up to Ableton itself if I need that. And in fact, I plan to do just that early on as I get some experience with the first modules and before I get a modular sequencer. Also respectfully agree on the active/passive mult. It is not a super big price to pay for future proofing. If the Xaoc module is the Zadar, that looks really nice, too. Compact and the menuing doesn't look like it taxes the brain too much. I will take your advice to heart about building in stages and letting the not-full case tell me what it needs. If you don't need panning, you might want to consider Intellijel's Mixup - 4 channels in (2mono, 2stereo), 1 stereo out. They are chainable, they have mutes, and they're relatively cheap. And even if you get 2 of them, you end up with only 12hp. My initial thought on my build was that I would save some cash and let my DAW handle the heavy sequence lifting. It seemed a little daft to have an entire MIDI capable DAW and then replicate a portion of it inside of a Eurorack case. Hooking it up to the DAW really impacted my workflow. It seemed a better fit for augmented a piece created in a DAW with some Eurorack flavor than as part as a compositional tool. When I'm wiggling and standing there with a handful of patch cables, going to the DAW felt alien. Until the 1010 Music Toolbox comes, I've been using Ornament & Crime as a sequencer. The point above is don't be afraid to be WRONG about your needs. Your going to order things that sound great on paper you won't use. I have a Lifeforms 8 step microsequencer that gets almost zero use. I bought a Behringer Neutron that rarely has an electron flowing through it. No matter how much planning and exploration you do. You're going to have some regrets. Take it slow, order a handful of things until you experience what direction you ultimately want to go in. You may find yourself... in a shotgun shack... with a beautiful wife... cursing set-up "A" you've spent a fortune on when in your heart you're really a set-up "B" kind of person... because you've found that's what inspires you around modular. Sorry for the lecture. But responding helps me focus my thoughts as well as helping someone else on the ladder. I would wait on the Akemie's Castle but leave room for it in your rack. Get a feel for a smaller set-up and branch out. Ronin, no worries about the comments. I actually really appreciate the candor and am here precisely for the kinds of advice and info that you won't get from demo videos on a manufacturer's website. I also should have noted that the goal isn't to use a hybrid DAW/Eurorack setup in the long run. Really the use of Ableton as a sequencer will be for early stages getting that knob wiggling time in and getting experience passing modulation CV around. Do at least make sure you have some way of locking up clocks between Ableton and the modular, though. You'll find that to be extremely useful. Even so, I'd still consider some way to pass more than just a clock to the modular from Live; the fact that M4L is in there (depending on which version you're using) opens up massive possibilities for modular control that will definitely exceed human limitations. 1u row except for the Zeroscope, BIA, Ripples, Maths, Quad VCA, Pamela's New Workout, Akemie's Castle, Atlantis and a Beatstep Pro. The Zadar is pre-ordered. Modules were bought in stages and in my first pass I used Ableton to sequence thru the uMIDI. That was great for getting up to speed, but after considering the 3 primary sound sources, I decided to hold off on sequencing in the case and picked up a BSP, which works great and is close enough to being a physical experience rather than a computer driven one since there is no mouse tempting me to tweak something minuscule in the sequencing. For the time being, I am mostly running only two things at a time (e.g., a BIA/Atlantis duet or a Akemie/Atlantis duet) with each taking an out channel in the case. The two channels go into an audio interface into two tracks in Live for effects, mostly delay and reverb. Live can also supply the drum machine or other accompaniment. I am going to look at something with lots of headroom and see if it can handle the signal strength of the modular. If not, I'll probably follow Lugia's advice in that thread and look into supplementing the Intellijel case's outs with Ladik P-530s. If that is needed, it would likely take up some/all of the space of the Varigate 4+ in this latest iteration. I am grateful for all the advice here, but a few points that I have acted on are Lugia's note that the Akemie's Castle will eat up modulation and envelopes and Ronin's comments about letting the case tell you what it wants next (in so many words). Since I was compelled to get my hands on the tactile FM that is AC, but also mindful of these comments, I got the Pamela. It's is a great source of timed modulation in a relatively small space and I can't wait for the Zadar to show up. Thanks for all the feedback so far and keep them coming if you have any comments about the current iteration. Actually, the Zadar is a really good idea as a companion for the Akemie's Castle! Coupling that with the Pams and the Varigate could yield some really interesting FM results...nice! 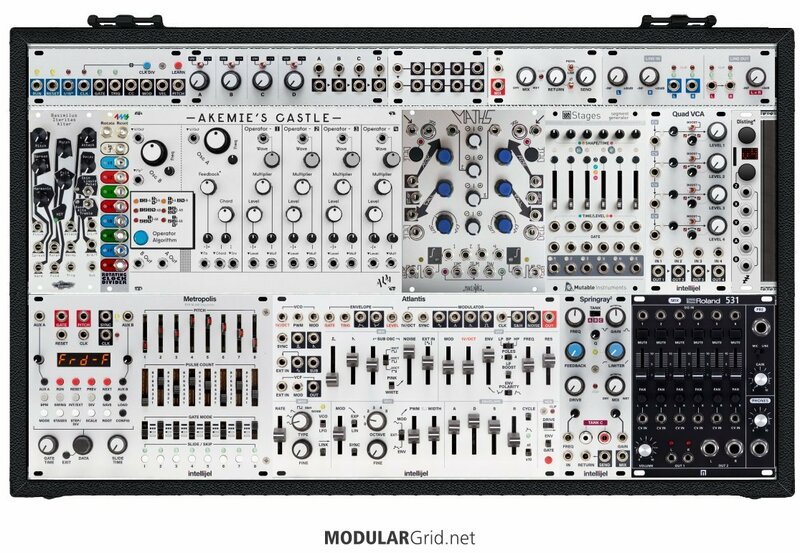 I recently contemplated a layout of a “portable” sub-rack and settled on an Intellijel 7U case, such as you did. I had a few design iterations with some Muffwiggler FB group input and some trying out. Turns out: I didn’t think the Mimetic Digitalis is well suited to controlling categorical CV (say the b/s/l on a Manis), so I needed a bit more immediate control. I found that I took a liking to using my modular to complement a sampler (drums, percussion) with harsher basslines and additional percussion. I also quite like the sonic possibilities of combining the Ataraxic Iteritas with a uPlaits for LPF bass, especially using a sequenced mix via Plancks (uFrames) for more timbral control. So, the underlying design concept was: Manis for percussion, Ataraxic+Beehive for bass. I wanted CV control and sequencing ability for both feeds independently, delay and reverb are essential to the sound I am after. Some distortion would be nice, too. In this setup you see Manis, MLSC, Verb Form a percussion chain. I opted for two Quadratt 1U as sub-mixers and that works great. One audio stream will be a side chain feed for the MLSC compressor and a second a utility reverb via the verb. Plancks will blend Beehive, Ataraxic, and a delay-reverb using the Black Hole DSP2 and Erbeverb chain under full CV control (reverb solo and delay solo can be mixed in via the second Quadratt). The Voltage block will allow extensive control over the mix (Plancks), Delay (Black Hole), and reverb (Erbeverb). Pam’s offers up to 8 LFOs (I’m a sucker for those) and Rene two direct control gate/CV channels for Manis and Beehive/Ataraxic. Manis has its own Envelope, and Tallin offers two VCAs with distortion for Hive and Ataraxic. A quad envelope can control both VCAs and still offer two envelopes for filter control. I opted for the Morgasmatron as a SVF with pleasant distortion (I love how this filter clips and the built in Rat distortion is neat as well) and Three Sisters owing to sonic capabilities and HP demand (vs QPAS). Tempi has the immediacy of well laid out performance features, which allows for on the fly clock division changes controlling the Quad Env and Voltage Block. Ornament & Crime combined with an ARP module just round it out nicely. I know I’m missing a logic module and really pondered swapping the o_C with a WMD Triple Bipolar, but feel that I should be able to do-opt one Quadratt for CV duty.